Not to be confused with Bitpop. Britpop was a UK-based music and culture movement in the mid-1990s which emphasised "Britishness", and produced brighter, catchier alternative rock, partly in reaction to the popularity of the darker lyrical themes of the US-led grunge music, an alternative rock genre, and to the UK's own shoegazing music scene. The most successful bands linked with the movement are Blur, Oasis, Suede and Pulp; those groups would come to be known as its "big four". The timespan of Britpop is generally considered to be 1993–1997, with 1994–1995, and a chart battle between Blur and Oasis dubbed "The Battle of Britpop", being the epicentre of activity. While music was the main focus, fashion, art, and politics also got involved, with artists such as Damien Hirst being involved in creating videos for Blur, and being labelled as Britart or Britpop artists, and Tony Blair and New Labour aligning themselves with the movement. Though Britpop is viewed as a marketing tool, and more of a cultural moment than a musical style or genre, there are musical conventions and influences the bands grouped under the Britpop term have in common, such as showing elements from the British pop music of the 1960s, glam rock and punk rock of the 1970s, and indie pop of the 1980s in their music. Britpop was a media-driven focus on bands which emerged from the independent music scene of the early 1990s—and was associated with the British popular cultural movement of Cool Britannia which evoked the Swinging Sixties and the British guitar pop music of that decade. In the wake of the musical invasion into the United Kingdom by American grunge bands, new British groups such as Blur, Pulp and Suede launched the movement by positioning themselves as opposing musical forces, referencing British guitar music of the past and writing about uniquely British topics and concerns. These bands were soon joined by others including Oasis, The Verve, Supergrass, Cast, Sleeper and Elastica. 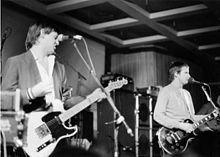 XTC (pictured in 1980) and the Kinks' Ray Davies are sometimes cited as the "godfathers of Britpop". Though Britpop is seen retrospectively as a marketing tool, and more of a cultural moment than a musical style or genre, there are musical conventions and influences the bands grouped under the Britpop term have in common. Britpop bands show elements from the British pop music of the Sixties, glam rock and punk rock of the Seventies, and indie pop of the Eighties in their music, attitude, and clothing. Specific influences vary: Blur and Oasis drew from the Kinks, early Pink Floyd and the Beatles, respectively, while Elastica had a fondness for arty punk rock, notably Wire. Regardless, Britpop artists project a sense of reverence for British pop sounds of the past. The Kinks' Ray Davies and XTC's Andy Partridge are sometimes advanced as the "godfathers" or "grandfathers" of Britpop. Alternative rock acts from the indie scene of the Eighties and early Nineties were the direct ancestors of the Britpop movement. The influence of the Smiths is common to the majority of Britpop artists. The Madchester scene, fronted by the Stone Roses, Happy Mondays and Inspiral Carpets (for whom Oasis's Noel Gallagher had worked as a roadie during the Madchester years), was an immediate root of Britpop since its emphasis on good times and catchy songs provided an alternative to the British-based shoegazing and American based grunge styles of music. Pre-dating Britpop by four years, Liverpool based group The La's hit single "There She Goes" was described by Rolling Stone as a "founding piece of Britpop's foundation." Local identity and regional British accents are common to Britpop groups, as well as references to British places and culture in lyrics and image. Stylistically, Britpop bands use catchy hooks and lyrics that were relevant to young British people of their own generation. Britpop bands conversely denounced grunge as irrelevant and having nothing to say about their lives. Damon Albarn of Blur summed up the attitude in 1993 when after being asked if Blur were an "anti-grunge band" he said, "Well, that's good. If punk was about getting rid of hippies, then I'm getting rid of grunge." In spite of the professed disdain for the genres, some elements of both crept into the more enduring facets of Britpop. Noel Gallagher has since championed Ride and once stated that Nirvana's Kurt Cobain was the only songwriter he had respect for in the last ten years, and that he felt their music was similar enough that Cobain could have written "Wonderwall". By 1996, Oasis's prominence was such that NME termed a number of Britpop bands (including The Boo Radleys, Ocean Colour Scene and Cast) "Noelrock", citing Gallagher's influence on their music. Journalist John Harris typified these bands, and Gallagher, of sharing "a dewy-eyed love of the 1960s, a spurning of much beyond rock's most basic ingredients, and a belief in the supremacy of 'real music'". The imagery associated with Britpop was equally British and working class. A rise in unabashed maleness, exemplified by Loaded magazine and lad culture in general, would be very much part of the Britpop era. The Union Jack became a prominent symbol of the movement (as it had a generation earlier with mod bands such as The Who) and its use as a symbol of pride and nationalism contrasted deeply with the controversy that erupted just a few years before when former Smiths singer Morrissey performed draped in it. The emphasis on British reference points made it difficult for the genre to achieve success in the US. Select magazine's April 1993 issue emphasised "Great British pop"
John Harris has suggested that Britpop began when Blur's single "Popscene" and Suede's "The Drowners" were released around the same time in the spring of 1992. He stated, "[I]f Britpop started anywhere, it was the deluge of acclaim that greeted Suede's first records: all of them audacious, successful and very, very British". Suede were the first of the new crop of guitar-orientated bands to be embraced by the UK music media as Britain's answer to Seattle's grunge sound. Their debut album Suede became the fastest-selling debut album in the history of the UK. 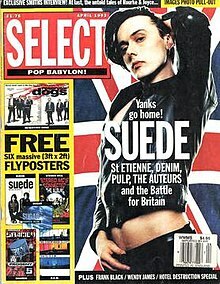 In April 1993, Select magazine featured Suede's lead singer Brett Anderson on the cover with a Union Flag in the background and the headline "Yanks go home!". The issue included features on Suede, The Auteurs, Denim, Saint Etienne and Pulp and helped start the idea of an emerging movement. Blur were involved in a vibrant social scene in London (dubbed "The Scene That Celebrates Itself" by Melody Maker) that focused on a weekly club called Syndrome in Oxford Street; the bands that met up were a mix of music styles, some would be labelled shoegazing, while others would go on to be part of Britpop. The dominant musical force of the period was the grunge invasion from the United States, which filled the void left in the indie scene by The Stone Roses' inactivity. Blur, however, took on an Anglocentric aesthetic with their second album Modern Life Is Rubbish (1993). 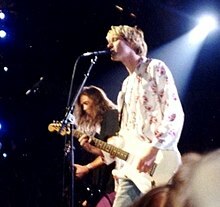 Their new approach was inspired by a tour of the United States in the spring of 1992. During the tour, frontman Damon Albarn began to resent American culture and found the need to comment on that culture's influence seeping into Britain. Justine Frischmann, formerly of Suede and leader of Elastica (and at the time in a relationship with Damon Albarn) explained, "Damon and I felt like we were in the thick of it at that point ... it occurred to us that Nirvana were out there, and people were very interested in American music, and there should be some sort of manifesto for the return of Britishness." John Harris wrote in an NME article just prior to the release of Modern Life is Rubbish, "[Blur's] timing has been fortuitously perfect. Why? Because, as with baggies and shoegazers, loud, long-haired Americans have just found themselves condemned to the ignominious corner labeled 'yesterday's thing'". The music press also fixated on what the NME had dubbed the New Wave of New Wave, a term applied to the more punk-derivative acts such as Elastica, S*M*A*S*H and These Animal Men. While Modern Life Is Rubbish was a moderate success, it was Blur's third album Parklife that made them arguably the most popular band in the UK in 1994. Parklife continued the fiercely British nature of its predecessor, and coupled with the death of Nirvana's Kurt Cobain in April of that year it seemed that British alternative rock was finally turning back the tide of grunge dominance. That same year Oasis released their debut album Definitely Maybe, which broke Suede's record for fastest-selling debut album. The term "Britpop" arose when the media were drawing on the success of British designers and films, the Young British Artists (sometimes termed "Britart") such as Damien Hirst, and on the mood of optimism with the decline of John Major's government, and the rise of the youthful Tony Blair as leader of the Labour Party. The term had been used in the late 1980s in Sounds magazine by journalist John Robb to refer to bands such as The La's, The Stone Roses, and Inspiral Carpets. However, it would be 1994 before Britpop started to be used by the UK media in relation to contemporary music and events. Bands emerged aligned with the new movement. At the start of 1995 bands including Sleeper, Supergrass, and Menswear scored pop hits. Elastica released their debut album Elastica that March; its first week sales surpassed the record set by Definitely Maybe the previous year. The music press viewed the scene around Camden Town as a musical centre; frequented by groups like Blur, Elastica, and Menswear; Melody Maker declared "Camden is to 1995 what Seattle was to 1992, what Manchester was to 1989, and what Mr Blobby was to 1993." A chart battle between Blur and Oasis, dubbed "The Battle of Britpop", brought Britpop to the forefront of the British press in 1995. The bands had initially praised each other but over the course of the year antagonisms between the two increased. 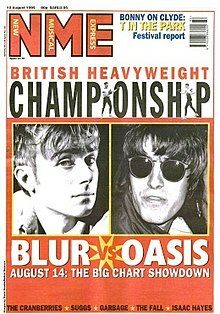 Spurred on by the media, the groups became engaged in what the NME dubbed on the cover of its 12 August issue the "British Heavyweight Championship" with the pending release of Oasis' single "Roll with It" and Blur's "Country House" on the same day. The battle pitted the two bands against each other, with the conflict as much about British class and regional divisions as it was about music. Oasis were taken as representing the North of England, while Blur represented the South. The event caught the public's imagination and gained mass media attention in national newspapers, tabloids, and television news. NME wrote about the phenomenon, "Yes, in a week where news leaked that Saddam Hussein was preparing nuclear weapons, everyday folks were still getting slaughtered in Bosnia and Mike Tyson was making his comeback, tabloids and broadsheets alike went Britpop crazy." "Country House" sold 274,000 copies to "Roll With It"'s 216,000 – the songs charting at number one and number two respectively. However, in the long run Oasis became more commercially successful than Blur, achieving sustained sales in the United States thanks to the singles "Wonderwall" and "Champagne Supernova". Oasis's second album, (What's the Story) Morning Glory? (1995), sold over four million copies in the UK, becoming the third best-selling album in British history. Oasis' third album Be Here Now (1997) was highly anticipated. Despite initially attracting positive reviews and selling strongly, the record was soon subjected to strong criticism from music critics, record-buyers and even Noel Gallagher himself for its overproduced and bloated sound. Music critic Jon Savage pinpointed Be Here Now as the moment where Britpop ended; Savage said that while the album "isn't the great disaster that everybody says," he noted that "[i]t was supposed to be the big, big triumphal record" of the period. At the same time, Blur sought to distance themselves from Britpop with their self-titled fifth album, assimilating American lo-fi influences such as Pavement. Albarn explained to the NME in January 1997 that "We created a movement: as far as the lineage of British bands goes, there'll always be a place for us ... We genuinely started to see that world in a slightly different way." As Britpop slowed, many acts began to falter and broke up. The sudden popularity of the pop group the Spice Girls has been seen as having "snatched the spirit of the age from those responsible for Britpop." While established acts struggled, attention began to turn to the likes of Radiohead and the Verve, who had been previously overlooked by the British media. These two bands—in particular Radiohead—showed considerably more esoteric influences from the 1960s and 1970s that were uncommon among earlier Britpop acts. In 1997, Radiohead and the Verve released their respective albums OK Computer and Urban Hymns, both widely acclaimed. Post-Britpop bands such as Travis, Stereophonics and Coldplay, influenced by Britpop acts, particularly Oasis, with more introspective lyrics, were some of the most successful rock acts of the late 1990s and early 2000s. Coldplay, the most commercially successful post-Britpop band, on stage in 2008. After Britpop the media focused on bands that may have been established acts, but had been over-looked due to focus on the Britpop movement. Bands such as Radiohead and The Verve, and new acts such as Travis, Stereophonics, Feeder and particularly Coldplay, achieved wider international success than most of the Britpop groups that had preceded them, and were some of the most commercially successful acts of the late 1990s and early 2000s. These bands avoided the Britpop label while still producing music derived from it. Bands that had enjoyed some success during the mid-1990s, but were not really part of the Britpop scene, included The Verve and Radiohead. The music of most bands was guitar based, often mixing elements of British traditional rock (or British trad rock), particularly The Beatles, The Rolling Stones and Small Faces with American influences. Post-Britpop bands also used elements from 1970s British rock and pop music. Drawn from across the United Kingdom, the themes of their music tended to be less parochially centred on British, English and London life, and more introspective than had been the case with Britpop at its height. This, beside a greater willingness to woo the American press and fans, may have helped a number of them in achieving international success. They have been seen as presenting the image of the rock star as an ordinary person, or "boy-next-door" and their increasingly melodic music was criticised for being bland or derivative. The cultural and musical scene in Scotland, dubbed "Cool Caledonia" by some elements of the press, produced a number of successful alternative acts, including The Supernaturals from Glasgow. Travis, also from Glasgow, were one of the first major rock bands to emerge in the post-Britpop era, and have been credited with a major role in disseminating and even creating the subgenre of post-Britpop. From Edinburgh Idlewild, more influenced by post-grunge, produced 3 top 20 albums, peaking with The Remote Part (2002). The first major band to breakthrough from the post-Britpop Welsh rock scene, dubbed "Cool Cymru", were Catatonia, whose single "Mulder and Scully" (1998) reached the top ten in the UK, and whose album International Velvet (1998) reached number one, but they were unable to make much impact in the US and, after personal problems, broke up at the end of the century. Other Welsh bands were Stereophonics, and Feeder. These acts were followed by a number of bands who shared aspects of their music, including Snow Patrol from Northern Ireland and Elbow, Embrace, Starsailor, Doves, Electric Pyramid and Keane from England. The most commercially successful band in the milieu were Coldplay, whose debut album Parachutes (2000) went multi-platinum and helped make them one of the most popular acts in the world by the time of their second album A Rush of Blood to the Head (2002). Bands like Coldplay, Starsailor and Elbow, with introspective lyrics and even tempos, began to be criticised at the beginning of the new millennium as bland and sterile and the wave of garage rock or post-punk revival bands, like the Hives, the Vines, the Libertines, the Strokes, the Black Keys and the White Stripes, that sprang up in that period were welcomed by the musical press as "the saviours of rock and roll". However, a number of the bands of this era, particularly Travis, Stereophonics and Coldplay, continued to record and enjoy commercial success into the new millennium. The idea of post-Britpop has been extended to include bands originating in the new millennium, including Razorlight, Kaiser Chiefs, Arctic Monkeys and Bloc Party, seen as a "second wave" of Britpop". These bands have been seen as looking less to music of the 1960s and more to 1970s punk and post-punk, while still being influenced by Britpop. Retrospective documentaries on the movement include The Britpop Story – a BBC programme presented by John Harris on BBC Four in August 2005 as part of Britpop Night, ten years after Blur and Oasis went head-to-head in the charts, and Live Forever: The Rise and Fall of Brit Pop, a 2003 documentary film written and directed by John Dower. Both documentaries include mention of Tony Blair and New Labour's efforts to align themselves with the distinctly British cultural resurgence that was underway, as well Britpop artists such as Damien Hirst. At the beginning of the decade of the 10's there appeared a series of new bands that combined the indie rock with the britpop of the 90s. The first band of Britpop Revival was Viva Brother with their debut album "Famous First Words" although they did not get great support from the specialised music press. Soon after in 2012 All The Young released their debut album "Welcome Home". Years later appeared new bands of this genre The Creases, Peace, Superfood and DMA's. This latest DMA's with its debut album obtained favourable reviews from the specialised press..
^ a b Ian Youngs (15 August 2005). "Looking back at the birth of Britpop". bbc.co.uk. ^ Derek B Scott (28 January 2013). "The Britpop Sound". Britpop and the English Music Tradition. Ashgate Publishing, Ltd. p. 103. ^ Michael Hann (24 April 2014). "Britpop: a cultural abomination that set music back". theguardian.com. ^ Hann, Michael (25 August 2013). "Suede – review". The Guardian. Guardian Media Group. Retrieved 4 May 2016. ^ Gray, Chris (13 May 2015). "A Brief Britpop Refresher Course". Houston Press. Retrieved 10 January 2017. ^ Matthew Collings (30 August 1997). "Arts: The new establishment". independent.co.uk. ^ Taylor Parkes (28 April 2014). "A British Disaster: Blur's Parklife, Britpop, Princess Di & The 1990s". thequietus.com. ^ John Harris (6 May 2003). "The Britpop years". independent.co.uk. ^ a b c Rupert Till (2010). "In my beautiful neighbourhood: local cults of popular music". Pop Cult. A&C Black. p. 90. ^ Miranda Sawyer (April 2014). "How Britpop Changed The Media". bbc.co.uk. ^ Mark Simpson (5 November 1999). "The man who murdered pop". theguardian.com. ^ a b Harris, pg. 385. ^ a b c Harris, pg. 354. ^ a b Harris, p. 347–48. ^ a b Reid, Graham (1999). "XTC's Andy Partridge interviewed: A man in the middle ages". Elsewhere. ^ a b Bennett, Professor Andy; Stratton, Professor Jon (2013). Britpop and the English Music Tradition. Ashgate Publishing, Ltd. ISBN 978-1-4094-9407-2. ^ Michael Dwyer (25 July 2003). "The great Britpop swindle". The Age. ^ Nick Hasted (18 August 2005). "The summer of Britpop". Independent. ^ John Harris (2004). Britpop! : Cool Britannia and the Spectacular Demise of English Rock. Da Capo Press. p. 202. ISBN 030681367X. ^ a b "Explore: Britpop". Allmusic.com. January 2011. ^ "40 Greatest One-Album Wonders: 13. The La's, 'The La's' (1990)". Rolling Stone. 10 May 2018. ^ a b John Harris (10 April 1993). "A shite sports car and a punk reincarnation". NME. ^ Matthew Caws (May 1996). "Top of the Pops". Guitar World. ^ Kessler, Ted. "Noelrock!" NME. 8 June 1996. ^ Simon Reynolds (22 October 1995). "RECORDINGS VIEW; Battle of the Bands: Old Turf, New Combatants". The New York Times. ^ The Last Party: Britpop, Blair and the Demise of English Rock; John Harris; Harper Perennial; 2003. ^ a b c Erlewine, Stephen Thomas. "British Alternative Rock". AllMusic. Retrieved on 21 January 2011. Archived from the original on 9 December 2010. ^ a b c d e Live Forever: The Rise and Fall of Brit Pop. Passion Pictures. 2004. ^ Stan Hawkins (2009). The British Pop Dandy: Masculinity, Popular Music and Culture. Ashgate Publishing, Ltd. p. 53. ^ Parkes, Taylor. "It's An NW1-derful Life". Melody Maker. 17 June 1995. ^ Richardson, Andy. "The Battle of Britpop". NME. 12 August 1995. ^ "Roll with the presses". NME. 26 August 1995. ^ "The UK's biggest studio albums of all time". OfficialCharts.com. 13 October 2018. Retrieved on 7 December 2018. ^ Mulvey, John. "We created a movement...there'll always be a place for us". NME. 11 January 1997. ^ a b c "Coldplay", Allmusic, retrieved 3 December 2010. ^ a b c d e J. Harris, Britpop! : Cool Britannia and the Spectacular Demise of English Rock (Da Capo Press, 2004), ISBN 0-306-81367-X, pp. 369–70. ^ a b c S. Dowling, "Are we in Britpop's second wave?" BBC News, 19 August 2005, retrieved 2 January 2010. ^ S. Birke, "Label Profile: Independiente", Independent on Sunday, 11 April 2008, retrieved 2 January 2010. ^ a b J. Goodden, "Catatonia – Greatest Hits", BBC Wales, 2 September 2002, retrieved 3 January 2010. ^ S. Borthwick and R. Moy, Popular Music Genres: an Introduction (Edinburgh: Edinburgh University Press, 2004), ISBN 0-7486-1745-0, p. 188. ^ a b S. T. Erlewine, "Travis: The Boy With No Name", Allmusic, retrieved, 17 December 2011. ^ a b c Bennett, Andy and Jon Stratton (2010). Britpop and the English Music Tradition. Ashgate Publishing. pp. 164, 166, 173. ISBN 0754668053. ^ "British Trad Rock", Allmusic, retrieved 3 January 2010. ^ A. Petridis, "Roll over Britpop ... it's the rebirth of art rock", The Guardian, 14 February 2004, retrieved 2 January 2010. ^ M. Cloonan, Popular Music and the State in the UK: Culture, Trade or Industry? (Aldershot: Ashgate, 2007), ISBN 0-7546-5373-0, p. 21. ^ A. Begrand, "Travis: The boy with no name", Pop matters, retrieved 2 January 2010. ^ "Whatever happened to our Rock and Roll", Stylus Magazine, 2002-12-23, retrieved 6 January 2010. ^ A. Petridis, "And the bland played on", Guardian.co.uk, 26 February 2004, retrieved 2 January 2010. ^ a b S. Hill, Blerwytirhwng? : the Place of Welsh Pop Music (Aldershot: Ashgate, 2007), ISBN 0-7546-5898-8, p. 190. ^ D. Pride, "Global music pulse", Billboard, Aug 22, 1998, 110 (34), p. 41. ^ V. Bogdanov, C. Woodstra and S. T. Erlewine, All Music Guide to Rock: the Definitive Guide to Rock, Pop, and Soul (Milwaukee, WI: Backbeat Books, 3rd edn., 2002), ISBN 0-87930-653-X, p. 1157. ^ M. Collar, "Travis: Singles", Allmusic, retrieved 17 December 2011. ^ S. Ross, "Britpop: rock aint what it used to be"[permanent dead link], McNeil Tribune, 20 January 2003, retrieved 3 December 2010. ^ J. Ankeny, "Idlewild", Allmusic, retrieved 7 January 2010. ^ "Catatonia", Allmusic, retrieved 3 January 2010. ^ V. Bogdanov, C. Woodstra and S. T. Erlewine, All Music Guide to Rock: the Definitive Guide to Rock, Pop, and Soul (Backbeat Books, 3rd edn., 2002), ISBN 0-87930-653-X, p. 1076. ^ a b "Stereophonics", Allmusic, retrieved 3 January 2010. ^ "Feeder", Allmusic, retrieved 3 December 2010. ^ "Feeder: Comfort in Sound", Allmusic, retrieved 3 December 2010. ^ P. Buckley, The Rough Guide to Rock (London: Rough Guides, 3rd end., 2003), ISBN 1-84353-105-4, pp. 310, 333, 337 and 1003-4. ^ M. Roach, This Is It-: the First Biography of the Strokes (London: Omnibus Press, 2003), ISBN 0-7119-9601-6, pp. 42 and 45. ^ C. Smith, 101 Albums That Changed Popular Music (Oxford: Oxford University Press, 2009), ISBN 0-19-537371-5, p. 240. ^ "Travis", Allmusic, retrieved 3 January 2010. ^ a b I. Collinson, "Devopop: pop Englishness and post-Britpop guitar bands", in A. Bennett and J. Stratton, eds, Britpop and the English Music Tradition (Aldershot: Ashgate, 2010), ISBN 0-7546-6805-3, pp. 163–178. ^ "Britpop Night on BBC Four - Tuesday 16 August". BBC Press Office. 18 July 2005. Retrieved 8 November 2010. ^ Chater, David (16 August 2005). "Viewing guide". The Times. Retrieved 8 November 2010. ^ "Britpop movie holds première". news.bbc.co.uk. 3 March 2003. ^ "Breaking Out: Viva Brother". Spin. 13 June 2011. Retrieved 9 January 2019. ^ "Britpop revivalists Viva Brother quietly announce their demise". The Independent. 4 April 2012. Retrieved 9 January 2019. ^ Lester, Paul (20 December 2011). "New band of the day – No 1,174: All the Young". The Guardian. ISSN 0261-3077. Retrieved 9 January 2019. ^ Daly, Rhian. "Superfood – 'Don't Say That'". NME. Retrieved 9 January 2019. ^ Beaumont, Mark (27 August 2015). "DMA's review – Britpop revivalists evoke 90s euphoria". The Guardian. ISSN 0261-3077. Retrieved 9 January 2019. ^ "Did DMA's Have to Grow Up So Fast?". Popmatters. 8 May 2018. Retrieved 9 January 2019. Harris, John. "Modern Life is Brilliant!" NME. 7 January 1995. Live Forever: The Rise and Fall of Brit Pop. Passion Pictures, 2004. Till, Rupert. "In my beautiful neighbourhood: local cults of popular music". Pop Cult. London: Continuum, 2010.